A Bedouin Tale | The Only Democracy? A couple of weeks ago, on a Friday afternoon, a few young men from the Bedouin town of Qasr al-Sir went walking on the hills just outside their village. Without warning, shots were fired from the other side of the hills, and one of the young men was killed, another wounded. The shots were fired by Israeli soldiers, who were practicing within a military firing range. A simple, unfortunate tragedy? Not quite. 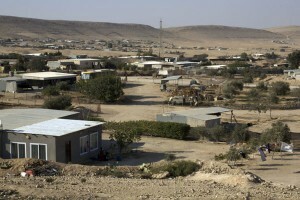 Qasr al-Sir is a Bedouin village in the Negev that was “recognized” by the Israeli government in 2003. The residents of Qasr al-Sir are actually originally from the area which is now the Israeli town of Dimona, but in the aftermath of the 1948 war, they were forcibly moved to other lands. Dimona became an Israeli “development town” for new immigrants, specifically those from North Africa, and in later years, from the Soviet Union. Dimona, of course is mostly famous for the “secret” nuclear plant that is located right outside it. Qasr al-Sir was an “unrecognized” village in its new location—meaning it didn’t appear on any maps, didn’t receive any basic services like water, electricity, paved roads, sewage treatment, or garbage collection, and its homes could be destroyed at any time. The group of villages that were “recognized” in 2003 are controversial, because in return for the recognition, they gave up the right to the rest of their territorial land. For Qasr al-Sir, this means that while the village itself now has some “amenities”–such as a school, some paved roads, and protection from home demolitions–it is still dealing with conditions that are unthinkable in Jewish communities in Israel. One of these problems is that right up to its very boundaries, unmarked, is a military training zone where soldiers can fire freely. The village is literally fenced in by the military. This is no coincidence on a systemic level, as 85% of the Negev (or Naqab in Arabic) has been either requisitioned as a closed military zone or nature preserve. This is one of the ways that the Bedouins in the Negev have been forced to relinquish more and more of their lands, forced into isolated urban and rural areas with minimal, if any services. The young man who was killed was a member of BUSTAN’s new eco-building training program. He was 19 years old. There was next to no media coverage of his death–one paragraph in YNET (the website of Yediot Ahronot, the largest Israeli daily paper) which mistakenly called the village “unrecognized” and implied that the men were trespassing–and nothing more. Similarly–no real investigation. When folks from BUSTAN called the local police chief to see why not, he was irritated and dismissive of their concerns. No one thinks the boy was killed on purpose. It was Friday afternoon, almost Shabbat, a time when it should have been quiet and it would have been safe to walk the hills. In that sense, it was a “mistake.” But it was a mistake that speaks entire worlds. Was the village in an uproar? I asked Ra’ed. No, he replied matter of factly. Two others had been killed this way two years before. Terrabin, the unrecognized Bedouin village that abuts Omer, one of Israel’s wealthiest communities, finally gave in to years of pressure. Homes have been repeatedly destroyed, and last year checkpoints were set up where residents were harrassed going in and out of the village. The residents agreed to move to different lands for compensation. Omer will expand.